In the late 1950s, a single mom struggled to raise her two young boys in inner city Detroit. Working long days at two and three jobs, her 8- and 10-year-old sons spent their afternoons watching television and were failing in school. But this single mom had grit. She began limiting TV to three shows a week and requiring them to read two library books a week and give her written book reports. Each week, she diligently looked over the reports and placed a check mark at the top. What started as a chore turned into a love for reading. As the books opened up new worlds of science and history right in their urban complex, the boys’ grades rocketed. The older brother went on to university becoming a successful engineer. The younger brother graduated from Yale on scholarship, then medical school and became a pediatric neurosurgeon at Johns Hopkins. He won international acclaim for pioneering cranial surgeries and today, the younger Carson brother, Ben, is running for president. Their mom? Years later, the brothers discovered that she couldn’t read. Born into a large, rural family, Sonya Carson left school in third grade. As young boys, they never knew their mom was unable to read the book reports she reviewed each week. Despite poverty, long work hours and her own illiteracy, Sonya Carson instilled a love of reading in her boys — a gift that altogether changed her family. 1. Let them stay up and read. 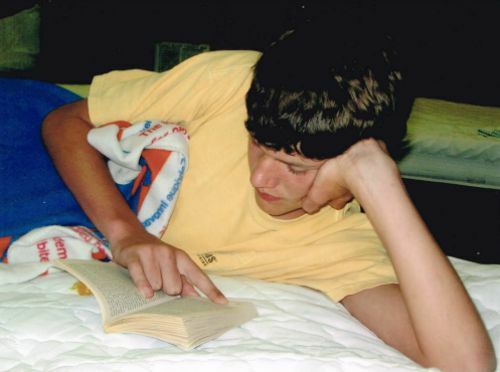 Astute parents know that you can set an early bedtime or let your kids to stay up 30 minutes later to read. Guess which one kids will choose? Give them a flashlight to use under the blankets and they’ll relish the stolen moments even more. 2. Help them start their own book collection. My nephew regularly spent his allowance on Berenstein Bear books. My own kids have loved collecting (and have fiercely protected) J.R.R Tolkien’s published works, the Horatio Hornblower series and out-of-print books. 3. Read aloud to your kids. This is common when our kids are little but it’s also beneficial for kids all the way through high school. Reading aloud provides shared experiences as a family and allows kids to hear vocabulary and syntax at a level higher than they could read themselves. I shared some of our favorite family read alouds here. 4. Give books as gifts. Books given as gifts become special treasures. We like to inscribe the name, date and a note from the giver on the inside cover. Our shelves hold favorite books given by aunts and uncles, grandparents and parents, all with a note in their handwriting. 5. Start a book club. When my daughter was an uninterested reader, I started a middle school girls book club. 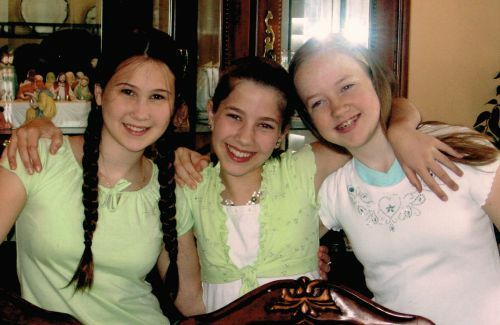 When she was in second grade, we held an American Girl book club. The clubs met once a week to discuss the book and cook or craft something related to the book. There was always plenty of time to play and book club became eagerly anticipated. My daughter credits her middle school book club as one of the primary things that helped her love reading. Our first middle school book club that provided friendship and great reading! 6. Keep books in the car. If your family is like mine, you spend considerable time in the car. When my kids were little, I’d keep a basket of board books. Because we do often have a short pile of books in our minivan, I plan to get something like this seat organizer. 7. Limit television and electronics. This is the area that needs pruning in our house. I can honestly say that the years we had no television were the years most filled with reading and creative play. Electronics can become such a default to fill time. 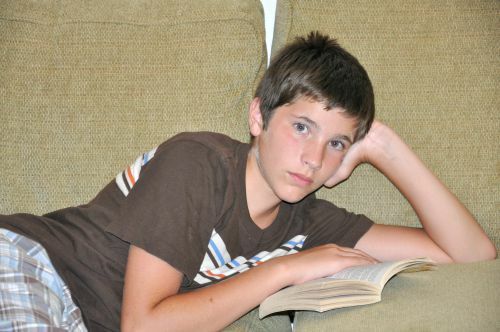 It also hard-wires the brains of children for constant stimulation, making it harder when they do settle down to read. 8. Use reading incentive programs. These aren’t limited to summer reading programs. Creating your own reading incentives — with rewards like shaved ice or extra privileges – can be very effective. There are also several free reward programs including: Pizza Hut BOOK IT!, Six Flags Read to Succeed and Chuck E Cheese. 9. Start a new Christmas Eve tradition. Two years ago, we adopted this tradition after watching my brother’s family do it for years. I love mulling over what book to get each child – and now daughter-in-law. My kids love opening a present the night before Christmas and this small, personal gift fits our Christmas Eve tradition so well. Here’s a list of favorites for boys of all ages. 10. Frequent the library. It continues to amaze me how much time my kids will spend reading books just checked out from the library. Libraries should be places of excitement and exploration, though I try to steer my kids to the books before they look at the DVDs. 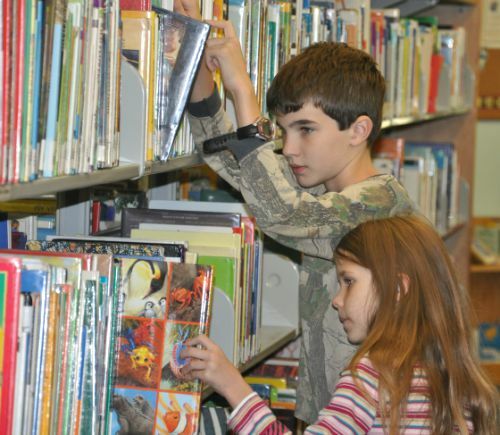 Kids can sort through the stacks and learn how to find fiction, non-fiction and biographies. 11. Subscribe to children’s magazines. Who doesn’t love opening the mailbox and finding this month’s edition of their favorite magazine? My kids will usually sit down and read it right then. There are a wide variety of magazines for kids including National Geographic Kids, Ranger Rick, Shine (girls Christian), Cobblestone (history), World kids (current events) and many more. 12. Get books on CD and mp3. These are a great way to help an emerging reader and encourage a reluctant reader. Kids can listen along with a hard copy of the book or listen while creating with art, building Legos or resting in the afternoon. 13. Listen to books on long trips in the car. I can vividly recall trips we’ve taken and the books that accompanied them as we listened on CD. I can’t say the same about any movies we’ve watched on trips. Even with a wide age range, there are plenty of entertaining books that can keep the entire family engaged on a long trip. You might even avoid the when-will-we-be-there questions. 14. Play Genre Bingo. My librarian introduced us to this fun game which encourages kids to read a wide variety of material. I can’t wait to use this game with my younger kids this year. I’ve pinned several variations of Genre Bingo here. 15. Hunt for good used books. Our library holds a massive sale every year and my kids love scouring for books they would enjoy. We also get pretty pumped about used book stores, estate sales and school discard sales. These are great places to find out-of-print treasures very inexpensively. 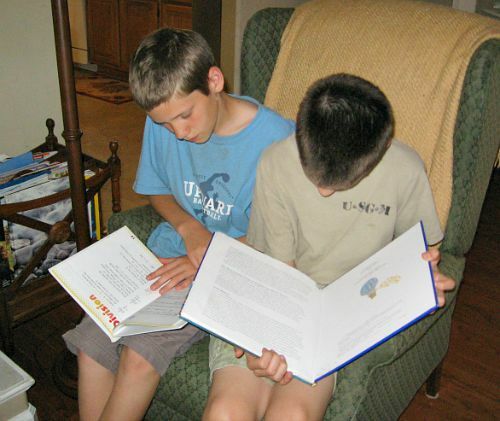 I’d love to know — how does your family instill a love of reading? What favorite traditions do y’all do? Comment and share! P.S. If you’d like to know when new posts are up, you can subscribe here. Or join the Facebook page (and click *get notifications*) for even more encouragement! Great ideas! We listen to audio books even when the car trip is short. The kids LOVE them! I do, too. Leslie, that’s the secret…I enjoy the audio books as well. 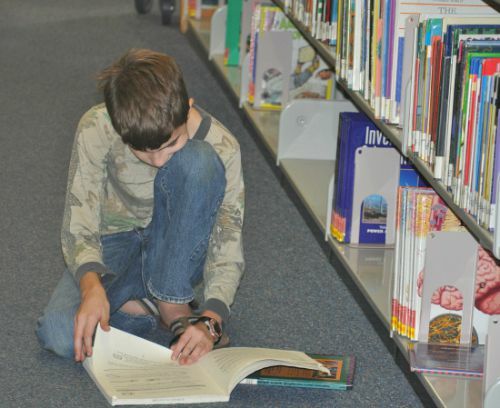 We limit the number of books checked out at the library to the age of each child checking them out. So, if you are 8, you may check out 8 books. It is so exciting for them when they have a birthday and can add another book to the library basket! We have multiple levels of reading interest among 4 children. While one we could punish by saying “no more reading today” another found it a death sentence to read independently! With our reluctant reader, we were thrilled to be introduced to the BOOKS ON CD section of the library! He now loves to listen and follow along in his book before bed. Yes! So helpful for active boys or any reluctant reader. Thank you Paige! Our daughter is eleven, and although she is an avid reader on her own, every evening before she goes to bed, I read to her for about 15 or 20 minutes. It has become our very special mother- daughter time. We both treasure it! What a sweet time. Those are moments that are hard to carve out of a busy night but are such an investment. That’s such encouragement! All great ideas! You’re such a great mom, Lisa!